In the United States, a mortgage loan can, if certain requirements are fulfilled, be guaranteed by The United States Department of Veteran Affairs (VA). 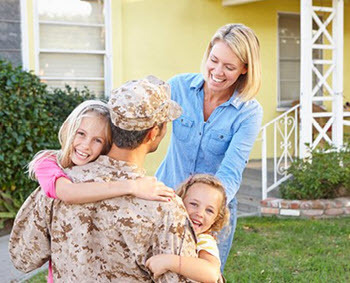 The home loan program for veterans was established towards the end of World War II to make it easier for returning war veterans to become home owners. A so called VA mortgage loan is usually not provided by the Department of Veteran Affairs (VA). Instead, the VA make the applicant more appealing to third-party lenders by, within certain limits, guaranteeing repayment of the loan. The VA thus provides a type of mortgage loan insurance. In October 2012, the Department of Veterans Affairs announced that they had now guaranteed home mortgage loan #20 million. Home mortgage loan #20 million was used to purchase a home in Woodbridge, Virginia, by the surviving spouse of an Iraq Veteran that died in 2010. A VA mortgage loan is available to United States military veterans and, in some cases, to their spouses. Can I borrow money from any third-party lender? No, VA will only guarantee mortgage loans provided by lenders that fulfil certain requirements set by VA.
Can I borrow money directly from VA? In most cases, no, you borrow from a third-party lender and VA provides mortgage insurance. There are exceptions though; in certain areas of the United States, the VA can make direct loans to qualifying borrowers who need a loan to purchase, construct or improve/repair/alter a home or farm residence. I don’t have money for a down payment – can VA help me? Yes, a qualifying veteran may receive a maximum of 103.3 percent financing. The 103.3 percent is calculated based on purchase price, or on reasonable value if that is lower than the purchase price. With a VA mortgage loan, the borrower must pay a funding fee of up to 3.3 percent of the loan amount to VA. It is possible to include the cost of the funding fee in the mortgage loan. That is why the cap for a VA mortgage loan is 103.3 percent instead of just 100 percent. Important: A veteran that receives a minimum of 10% VA disability compensation is exempt from the funding fee. I don’t have money to pay closing costs upfront – can VA help me? No, including closing costs in a VA mortgage loan is not permitted. I want to buy a luxury home – can I get a VA mortgage loan? Probably not. There is a cap on how large a VA insured mortgage loan can be. This cap is not the same for the entire country – it is instead calculated based on the varying house prices in different areas. This means that even if a small house in the San Francisco area and a luxury mansion in the Alabama countryside costs exactly the same, a veteran is more likely to qualify for the modest house than the luxury one. I want to buy a mobile home – can I get a VA mortgage loan? VA mortgage loans are available for both mobile and non-mobile homes. I’m a reservists – can I qualify for a VA mortgage loan? Thank’s to the Veterans Home Loan Program Amendments of 1992, reservists can qualify for a VA mortgage loan if they have served honourably for at least six years. I’m in the National Guard – can I qualify for a VA mortgage loan? Thank’s to the Veterans Home Loan Program Amendments of 1992, members of the National Guard can qualify for a VA mortgage loan if they have served honourably for at least six years. To apply for VA mortgage insurance, use the Fannie Mae loan application form 1003 (Freddie Mac 65). Documentation of any other assets, e.g. saving accounts, investments, trust funds, etc. A self-employed veteran must also provide two years of consecutive tax returns. Towards the end of WWII, the U.S. Congress passed an act that gave many benefits to returning war veterans. One of these provisions was the VA loan guarantee program, created to make it easier for returning war veterans to become home owners. For about 25 years, there were termination dates for applying for a VA guaranteed mortgage loan, but all such limits were removed by the Veterans Housing Act of 1970.